Poliklono Stefanidis Chris - Stefanidoy Zoe G.P. Page 16. 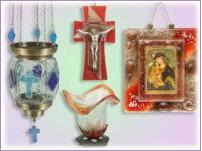 ECCLESIASTICAL ITEMS Our company produces religious items for the home, mainly from handmade glass. A wide range of vigil oil lamps, crosses and icons. 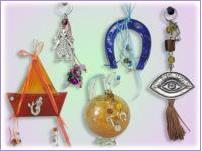 We areable to produce custom made products at your need. With modern design and innovative ideas we fully take advantage of the beauty and strength of blown and fused glass. SOUVENIRS Large variety of souvenirs and gifts, from handmade decorative glass and metal. Original designs, innovative ideas and modern design combine to create decorative products and gifts for every home. DECORATIVE ITEMS We use fused glass to produce various decorative and utilitarian objects for home and business premises. 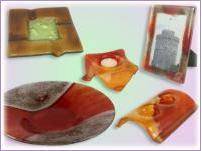 Platers, candle holders tea, lights, table lamps, coasters and ashtrays with simple and great aesthetics. Also we produce custom-made business gifts. Stefanidis Chris - Stefanidou Zoe G.P.